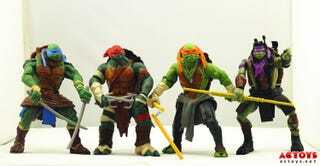 1) Michaelangelo is definitely wearing a hoodie around his waist. A hoodie that can't possibly fit him. 2) I think Donatello is wearing a proton pack. Did Ray accidentally flush one down the toilet? 3) The figures look all right from the front and back, but check out Leonardo in the very last pic — he looks thick. Like pro football linebacker thick. I'm not trying to weight-shame an anthropomorphic turtle who can kill me in seconds, but I have to think having a 56-inch chest might hinder one's ninja abilities.